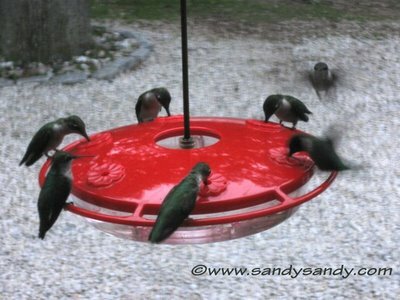 *SANDY SANDY ART*: I'VE GOT FLOCKS OF HUMMINGBIRDS! I had to take my Macbook Pro to the hospital today. Seems the (old ticker) battery isn't what it used to be. After the Mac Doctor ran some diagnostic tests, my fears were confirmed. A replacement is on order. Until it comes in, I'm tethered to the wall. A hard thing to get used to after 2.5 years of continuous roaming around The Sandarosa while online. Anyway at the Mac hospital I got talking to a couple of the technicians about two of my favorite subjects, HUMMINGBIRDS and photography. I had to search my sites for the information I wanted to show them, but found it on one of my newest Squidoo Lenses, An Obsession With Hummingbirds. Here you'll find a link to a photographer who specializes in photographing the incredible creatures and even gives in-detail, expert advise on how to do it!! Be sure to check out his wonderful hummingbird gallery too!! I'd mention him by name, however it doesn't seem to be on the site. It's just DyessCreek.com.